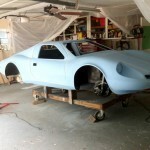 Kerry's Kelmark GT Project Begins. Anyone Spot A Stray Woodill Wildfire "Parts Holder" In The Background??? I love turning over the reins of more and more stories to talented researchers, builders, historians, and now…up and coming enthusiasts – like Kerry Griffin. I first met Kerry on my trip back from California with belly tank and Victress in tow, in 2008. I pulled into Houston on week 8 of a 2 month cross-country trip, and was visiting good friends Patrick McLoad (Venus), Mark Brinker (Glasspar and Sorrell), Bill Fester (Allied), and….the Griffin family – Ted, Greg, and Kerry (Woodill Wildfire). 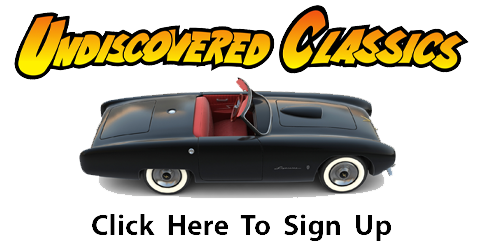 Houston sure has a lot of vintage fiberglass enthusiasts out there! When I arrived at the Griffin household, I was in store for a treat. Not only did I get a ride in one of the nicest Woodill Wildfires (originallly built in the 1950’s by Ted Griffin – and later restored by him too), but I got to meet his family and up and coming Forgotten Fiberglass enthusiast – Kerry Griffin. Kerry’s dad is Greg Griffin, and his grandfather is Ted. Ted built his Woodill Wildfire in the 1950’s and is one of two original owners and builders of this type of car who has held onto their dream. 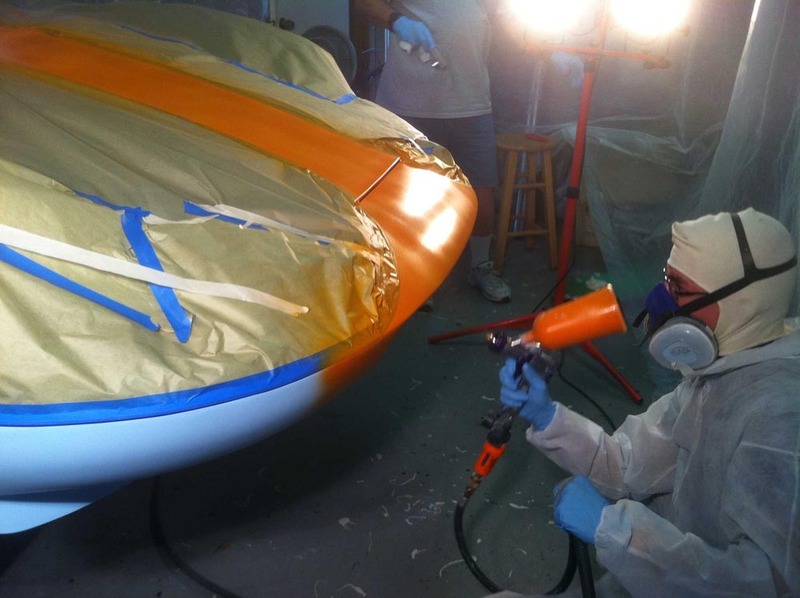 I see generations of fiberglass enthusiasts in the Griffin family for decades to come. 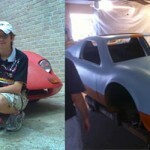 Back in 2008, I had a chance to meet young 15 year old Kerry and reviewed his initial work on his recently acquired Kelmark GT. 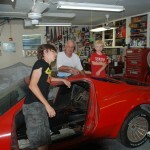 It was going to be quite a project, but three generations of Griffins would have a hand at it, and Kerry would take the helm directing and learning how to restore a car for the very first time. Here A Jumble of Griffins Wrestles With The Kelmark. From Left To Right is Kerry, Ted, and Young Kyle. I Think "Kyle's" The One In Charge In This Picture. 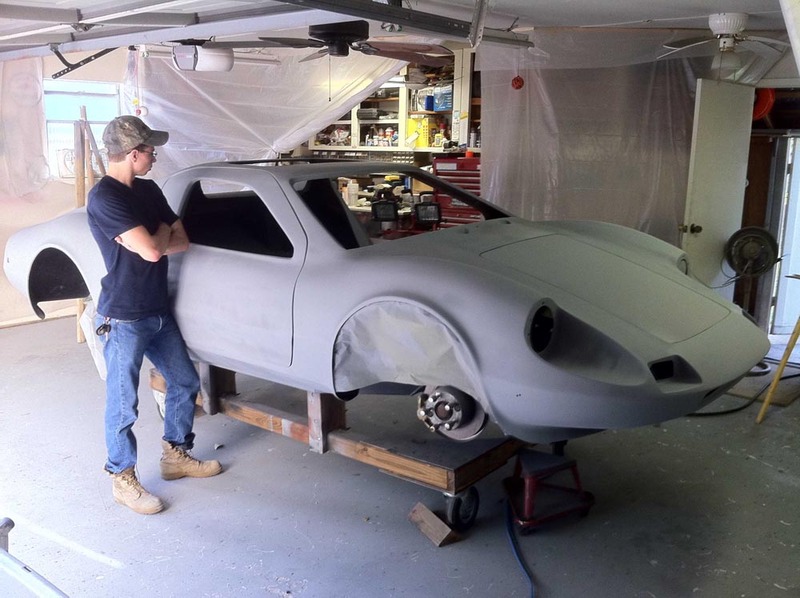 Recently, I asked Gregg if he wouldn’t mind asking his son if he would be interested in writing up his story on the Kelmark as well as reviewing the progress on his car. Kerry met the task head-on, and as a College Professor, I have to give him an “A” for effort in every way – as you’ll see in his story below. 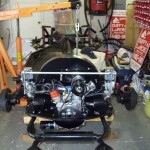 Kerry is 17 years old now and has done a remarkable job on a very special car. Great job on your car and story Kerry. 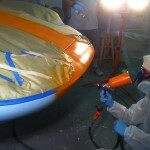 And as I promised, let me turn over today’s celebratory fiberglass article to up and coming author…..Kerry Griffin. 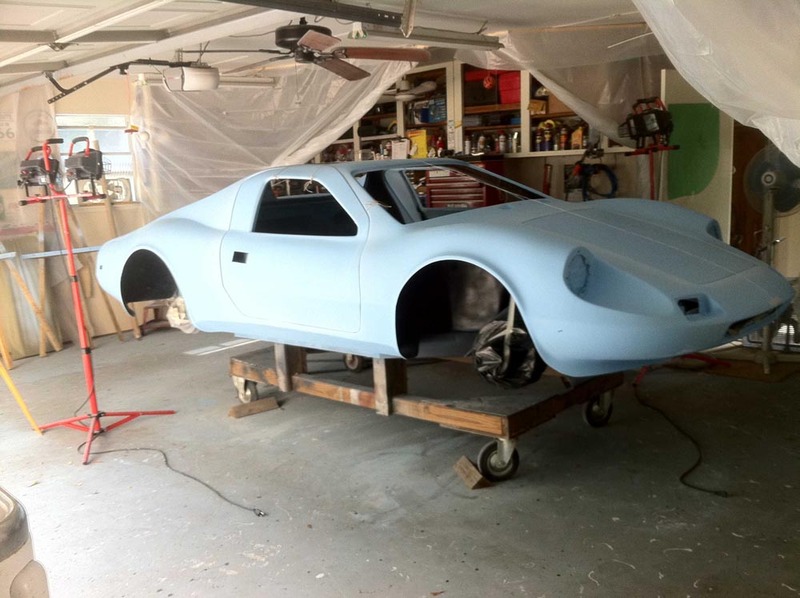 And by the way Kerry….this is the first story on our Forgotten Fiberglass website about Kelmark GT sports cars so you are trailblazing a new path for us and these cars. 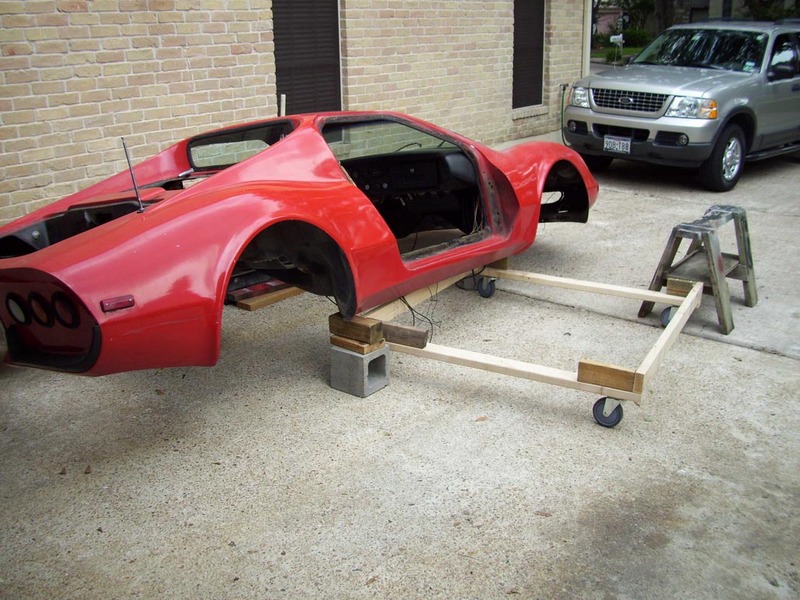 In 1969, a man named Bill Porterfield had an idea to create a kit car that could be easily built, had the beauty of a Ferrari and not cost you an arm and a leg to build. 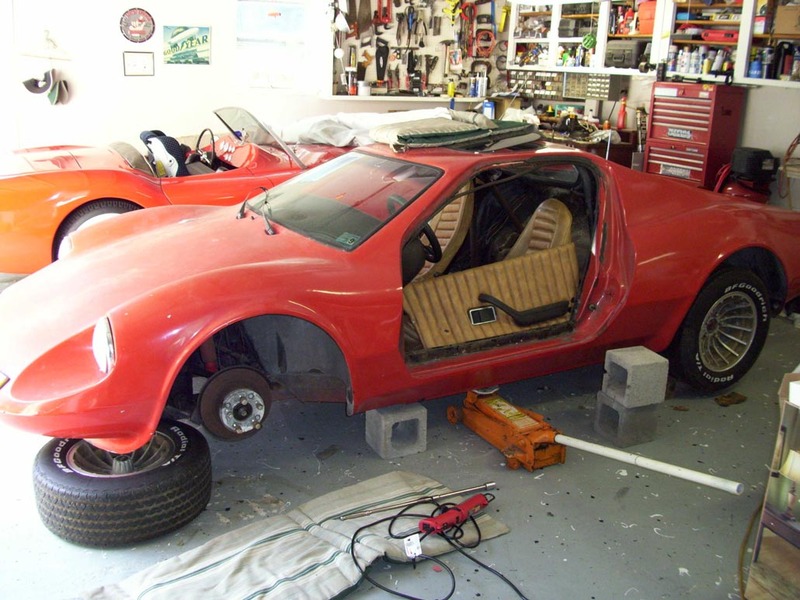 So, he designed a car that would have the chassis and powertrain of a VW Beetle and the body of a Ferrari 246GT. 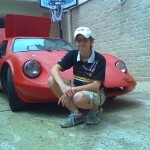 That car would later become the Kelmark GT. Here's Kerry Wrenching on The Chassis And Prepping It For Final Finish. It came in two models: the ‘Liberator’, which was very universal, and could be modified to fit V8 engines and Corvair transmissions. They were essentially designed to be customized to however the owner wanted. The ‘Independence’ however, was made to support the Volkswagen chassis and engine. The Independence model was for people who just wanted to get around, but didn’t want to have to pay too high of a price for the Liberator. 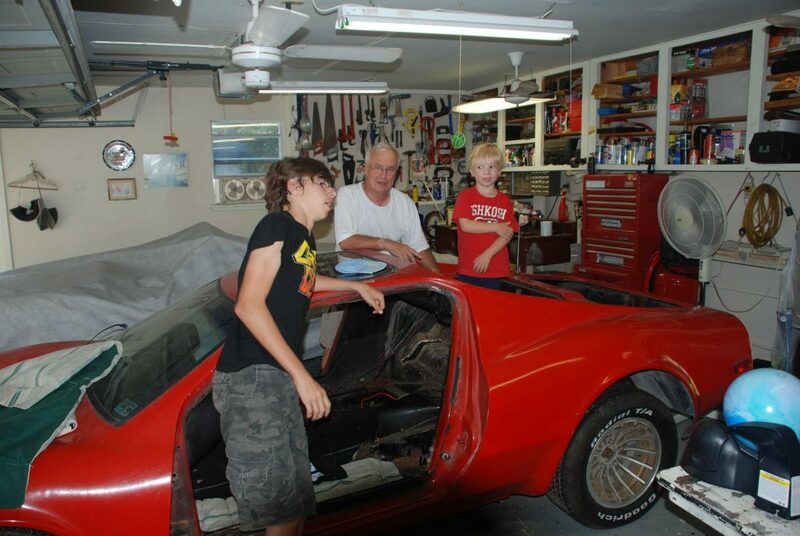 Two years ago (at the time, I was fifteen years old and about to turn sixteen), my Grandfather, Ted Griffin and I were on a hunt for my first car. His idea was that in order for me to get a car, I would have to learn how to work on it and fix it myself. So, after browsing through countless classified ads and spending way too many hours on eBay Motors, he finally called me up and said he’d found the ideal car for me. My father and I both agreed, so after talking to the seller a few times on the phone, we decided to take a trip down to Galveston Island to see this car. We pulled into the driveway to see a faded, worn out 1974 Kelmark GT that looked like it should be in the opening scene of a Cars film (don’t lie, we’ve all seen that movie a couple times). The car had no engine, the interior had more spiderwebs in it than upholstery, the pan was rusted and the body was looking pretty sorry. I insisted that we should still consider the car- I was fifteen years old and was given the opportunity to own a Ferrari kit. There was no way I was going to pass that chance up. After negotiating prices, we went back home to discuss the car. Once we all agreed to put in our effort and were willing to commit to this project, my Grandpa took a flatbed truck back down and bought the car. Wow! The Engine And Chassis Really Came Out Great. Nice Work Kerry! As the summer weeks went by, I spent every day at my grandparents’ house- working on the car, gathering information and taking pictures (I’m an avid journalist). 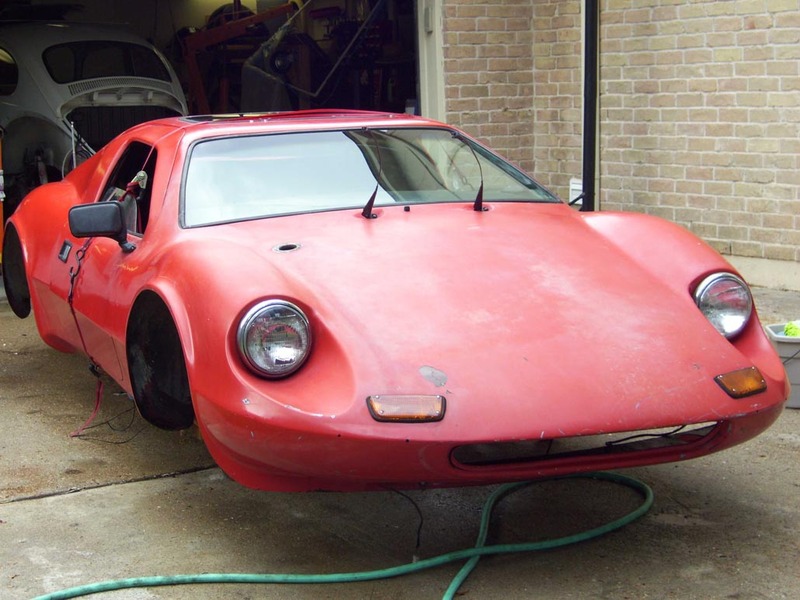 One day, Geoff Hacker came by and took a look at Grandpa’s ’55 Woodill Wildfire (yep, I live in a family of kit car builders) and managed to see the Kelmark, as well as I became introduced to his Victress and soon-to-be drop tank racer. I was pretty impressed by the amount of information he and a bunch of people, including Dad and Grandpa were able to find about these cars, and we talked for hours about kit cars and just about anything that had to do with them. Getting back on subject, My grandpa and I spent hour after hour tearing apart the car and finding some pretty wild things- like seashells in the air condition ducts, and even high-water marks inside the body. 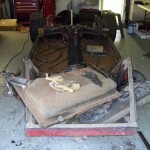 So, we took the body off the chassis and began working on individual sections of the car. 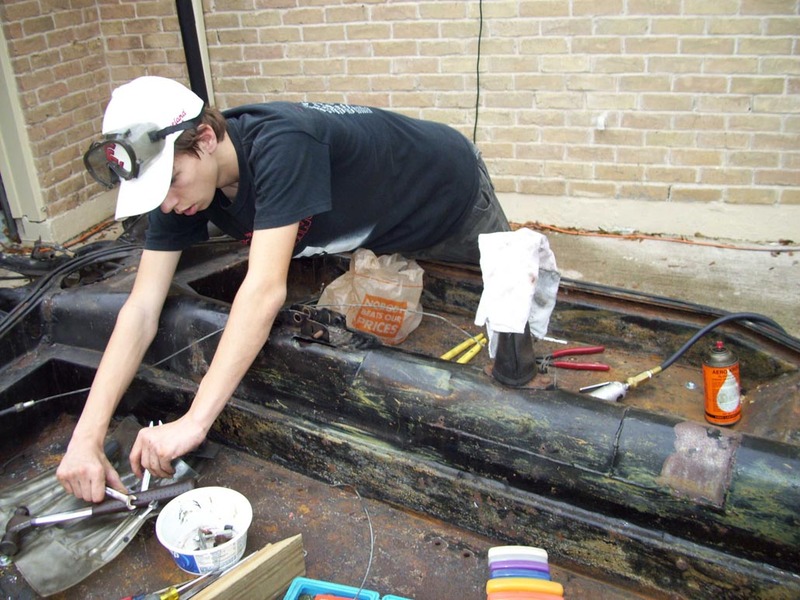 There would be days where we would be tearing out and replacing the suspension, and the next we would be grinding the chassis and putting on rust converter. Slowly but surely, my little Kelmark began to take the form of a working car again. They were little steps, but every time we got something to work would be like putting in another piece of the puzzle. Things were going great, until around mid-September. 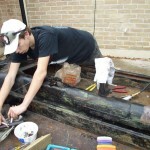 Hurricane Ike hit early morning on September 13, 2008. Houston and Galveston were devastated, and the car was put on hold while we worked on recovery from the storm. Three months after we bought the Kelmark, the same place where it had sat with its previous owner was now underwater. Here's Kerry in a Pensive Moment - Surveying What Had Been Accomplished and the Work Still To Do. We began to work on the Kelmark again, but we didn’t really have a reference to guide from. 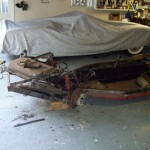 Grandpa began looking on eBay, and he found a 1971 Volkswagen Beetle that looked like it was in good shape. It had a somewhat good interior but it had no engine. 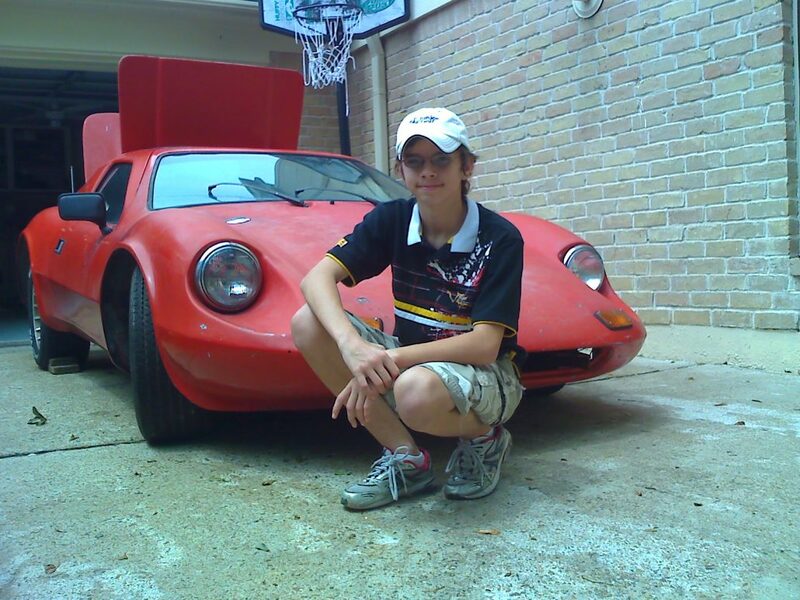 Needless to say, we drove up to Dallas and bought the car to use for parts, but the further we got into working on the Bug, the more we realized that this was too good of a car to just use for scrap. So, we put the Kelmark on hold and began to restore the Bug. My junior year of High School started in the fall of that year, and I would continue to go to my grandparent’s every chance I got to work on my cars. We managed to get the bug a remanufactured single-port, single carb 1600cc engine as well as the Kelmark got a Dual Port, Twin Carb 1641 bug engine with a brand-new set of headers and exhaust tips. We eventually got the Bug street-legal, and I began driving it to school. Soon after the Bug left the garage, the work resumed on the Kelmark. 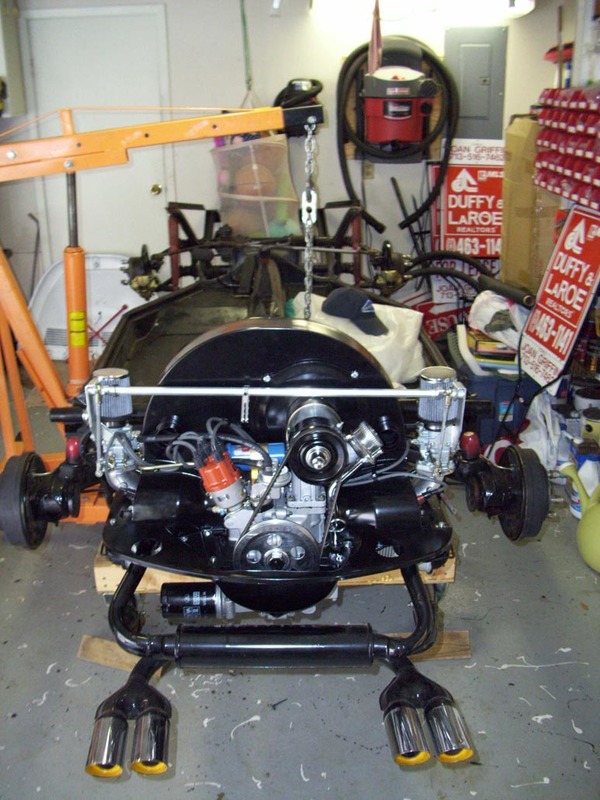 In a year, we had managed to completely rebuild and restore the transaxle and everything on the chassis, so we decided to try and see if the Kelmark would fire up and run. 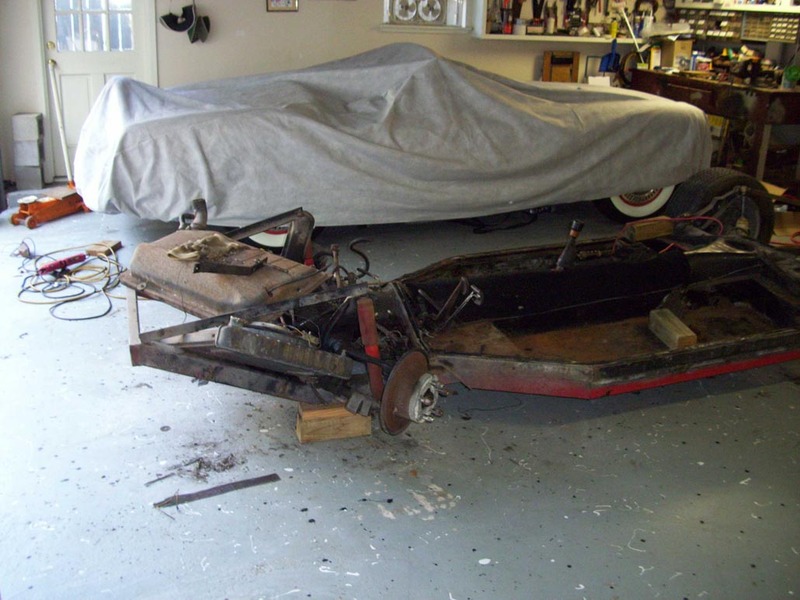 Grandpa and I wired up the engine and rebuilt and fastened the steering column to a frame that held it in place- now remember, the body is off the chassis, so we’re driving just a rolling chassis with an engine mounted. We got the engine to fire up, and after a few quick “test drives” by Dad, I sat in my Kelmark GT for the first time and drove it up and down the street. Once I had my fair share of fun, and by that I mean we ran out of gas, we moved on to the body work. If I live to be one hundred years old, one thing I’ll definitely remember is doing body work on that car. We must have put multiple thousands of hours into body work alone. First we stripped paint and if I can emphasize how much fun that was, I’d be shouting at you through the computer. Seriously, I’ll admit it was pretty fun- I may be the only person in the world who liked stripping paint, but it was good to get moving forward again. 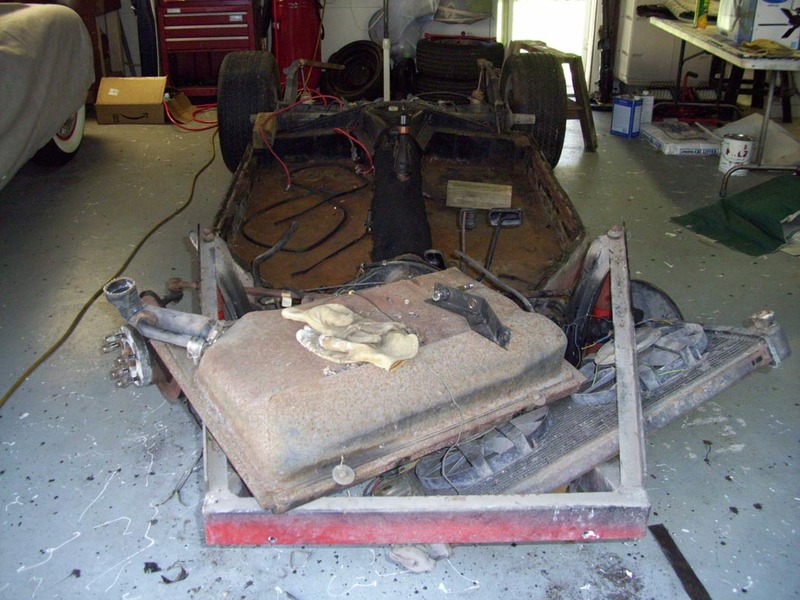 Once we got the paint off, we put the body back on the chassis and put the whole car up onto a rolling cradle that raised the car two feet off the ground, so we wouldn’t be hunched over while we worked. Here's a "Thumb's Up" From Kerry Just After The Paint Dried. 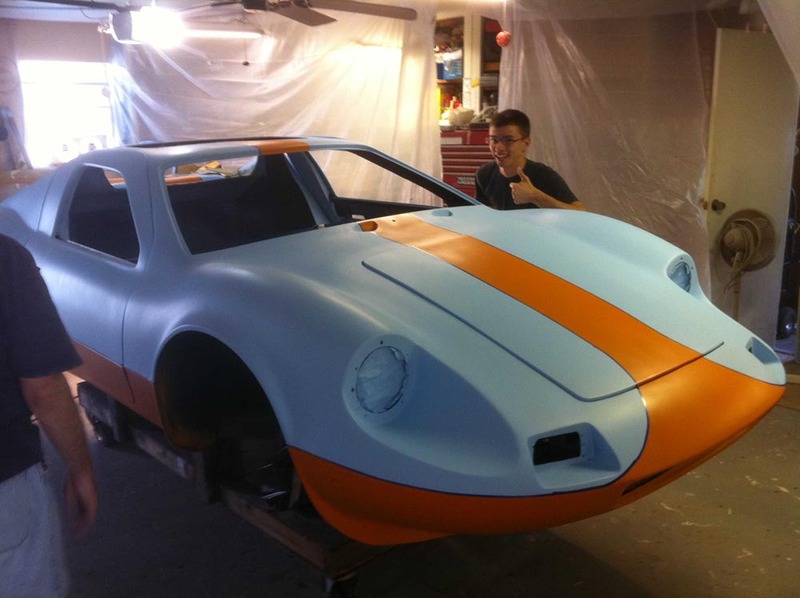 This Is Turning Out To Be One Fine Looking Kelmark GT! Then came the bondo and sanding. This was, and still is, my least favorite part about this car. Grandpa and I (and sometimes Dad) would be out in the garage, wet-sanding the car until late at night, or until one of us said “Uncle” and gave in. After the sanding came more Bondo. Then more sanding. 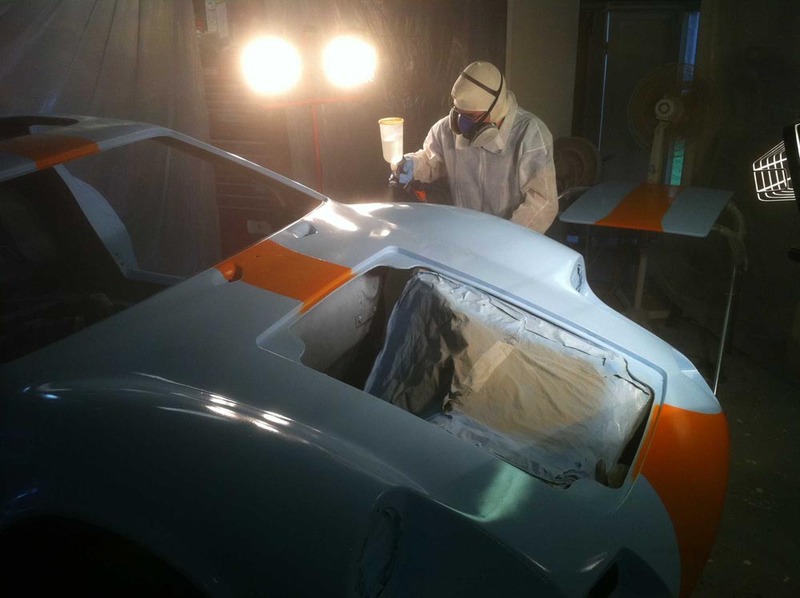 As we began to come to the point where we couldn’t get the car any more sanded down, we started thinking about how we should paint the car. I spent hours on the computer, looking at paint schemes and looking at cars that were similar to the Kelmark. 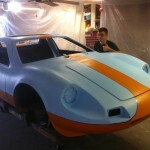 I eventually narrowed the competition down to two paint schemes: bright Ferrari red or the Gulf Racing blue and orange colors. 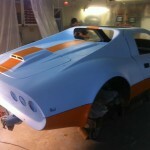 I went with the Gulf colors, so we took a trip up to our local Maaco and talked for a while with the guy. Suddenly, Grandpa thought it would be a good idea for me to learn how to paint a car, so we began to get everything we would need to paint a car- even down to the little shoe covers. We watched videos on how to paint a car multiple times, and when we finally felt we were ready, Grandpa and I suited up and turned the garage into a paint booth. We hung plastic, made a ventilation system and had a home-made air purification system. Once the prep work was over (we had covered most of the prep work during sanding), we finally hooked up the compressors and mixed the primer. The first time we tried to primer turned out to be a mess; and luckily we used a piece of wood covered with paper before we sprayed the car. The primer came out too coarse and made an ‘orange peel’ effect on the surface of the paper. I could have sworn I was looking at the surface of the moon. We then consulted an expert and good friend of my Grandfather’s, who guided us on proper paint gun setup and technique, and the problem miraculously disappeared. 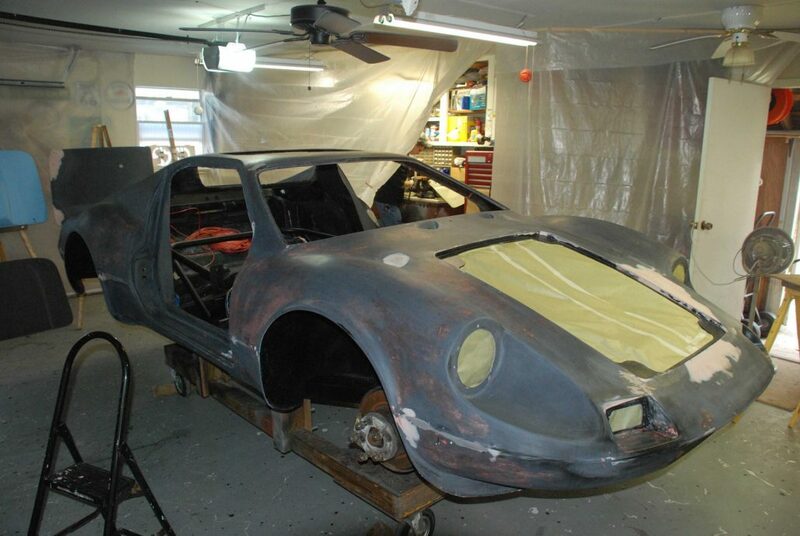 We got the primer on the car, and started sanding again. Grandpa and I went over the car countless times and fixed any imperfections in the body before going onto the next stage of painting, which was the primer-sealer. We sealed the car, which turned out to be close to the same color blue as the paint, and it gave us an idea of how well the paint would look. 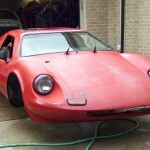 As of now, my Kelmark GT sits in the garage, awaiting to be painted at the end of this week. 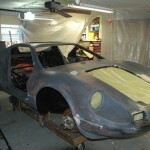 By Monday we hope to have the clear-coat on and the body work ultimately done. 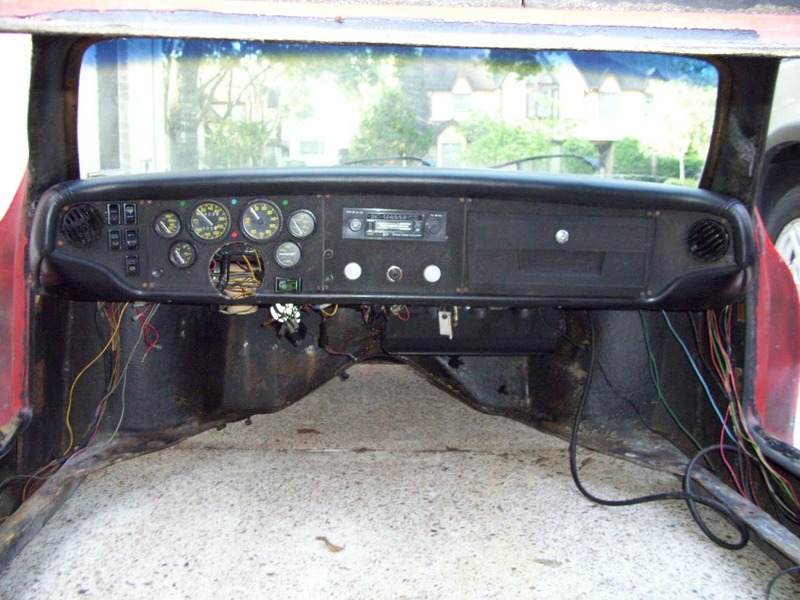 All we really have left to do in finishing the car is to get the dashboard mounted, put the interior in the car and wire the rest of the chassis to the body. My Grandfather and I have spent so much time on this car, it’s almost like it’s become a part of us. I know that he really enjoys spending time with me, and working on cars- and to me, this Kelmark GT is much more than just a car. This car is the epitome of that special connection that my Grandpa and I share. He and I have spent so much time together, I’ve come to realize that out of all the kids and grand kids, he and I are so much alike, it’s almost scary. This may be my favorite story on our website since we started it – even going back to Jon Greuel and I collaborating on www.ladawri.com. Kerry…you’ve done a remarkable job on your car and your story. I’m sure all of us here are cheering for the debut of your beautiful Kelmark GT. 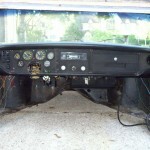 Kerry’s Kelmark GT Project Begins. Anyone Spot A Stray Woodill Wildfire “Parts Holder” In The Background??? Here A Jumble of Griffins Wrestles With The Kelmark. From Left To Right is Kerry, Ted, and Young Kyle. Here’s Kerry Wrenching on The Chassis And Prepping It For Final Finish. Here’s Kerry in a Pensive Moment – Surveying What Had Been Accomplished and the Work Still To Do. Here’s a “Thumb’s Up” From Kerry Just After The Paint Dried. 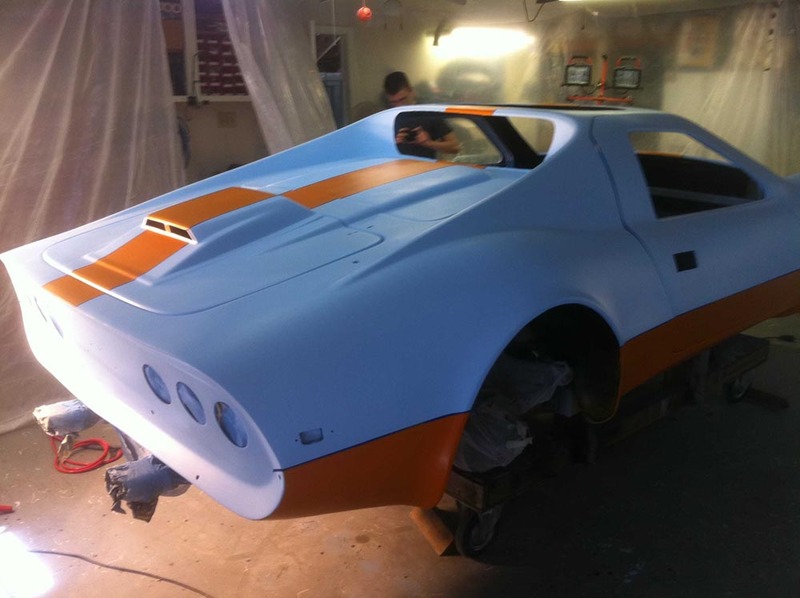 This Is Turning Out To Be One Fine Looking Kelmark GT! Send me an email and I’ll see what I can do for you. I have pictures and an old assembly manual (not complete, but most of it is there) that might help. Any idea how I can contact Kerry. 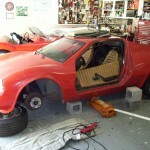 They did a great job and I need to cut a hood into a kelmark to have access to the front end Fiero stuff. Thanks. he is overseas now from what I understand. 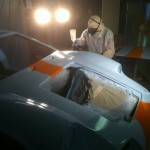 I am getting ready to cut the hood as the above builder one of my Kelmarks. Be careful cutting off anything thing that wont grow back. I bought the red Kelmark Ruby from Duane Cox in Atlanta in April 2017. It is power by a electric motor plugged into the transaxle. Batteries were not included. My plans are to install one of my air turbine generators into the mid section and power the electric motor by the 50k watt DC generator on board. When finished I will be able to achieve unlimited range in this Kelmark. Electric unlimited range is on the horizon. Oh yes it does not use any combustion fuels on board to create this self compressed air power.